Most of us want to use an administrator account to have full access to any on device settings just like on PLDT Home and myDSL broadband wired internet. There are a lot of things you can do on your router or modem page if you use the PLDT admin account. From restricting wireless users thru MAC filtering, port forwarding, changing of SSID, Bridging your router, back up and lots more. All of those benefits cannot be done when you're just accessing the router page using a normal user. To make that possible you must use the given root or admin account provided. When you go to your router web interface just use the admin credentials below. You also try another password if the first one is not working on your modem. Try other possible login page and new password below (Update for 2018 / 2019). Cannot login to adminpldt account? Try below steps on how to create Advance Admin account. Login to Basic admin account by going to 192.168.1.1 then login the username 'admin' and password '1234'. Create PLDT admin password by going to 192.168.1.1/userconfig_PLDT_admin.htm. 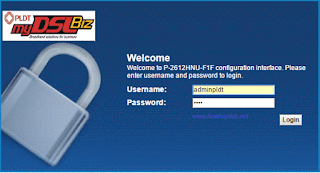 Create your desired admin password for 'adminpldt' username. This will mostly work on all PLDT myDSL issued modem like Zyxel, Speedsurf, Kasda, Huawei and other brands catered by the company. Login credentials will also work on PLDT Home DSL and Fibr router page. In case all of the credentials given above does not work on your PLDT router you can always call the PLDT hotline to ask for assistance regarding your problem. Try to run cmd on ur pc and enter ipconfig , then browse the default gateway as ur ip add . how to show password in asterisk sign? why cant i access the site? (192.168.1.1) someone help?